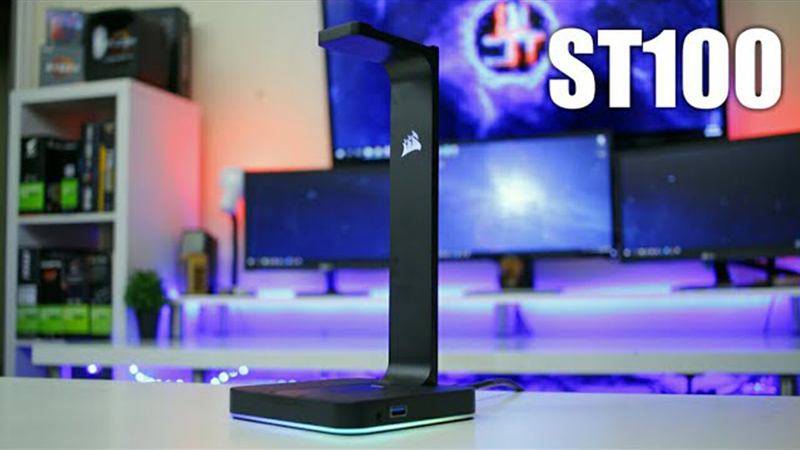 A few months back Corsair brought out the ST100 their Premium RGB headphone stand. 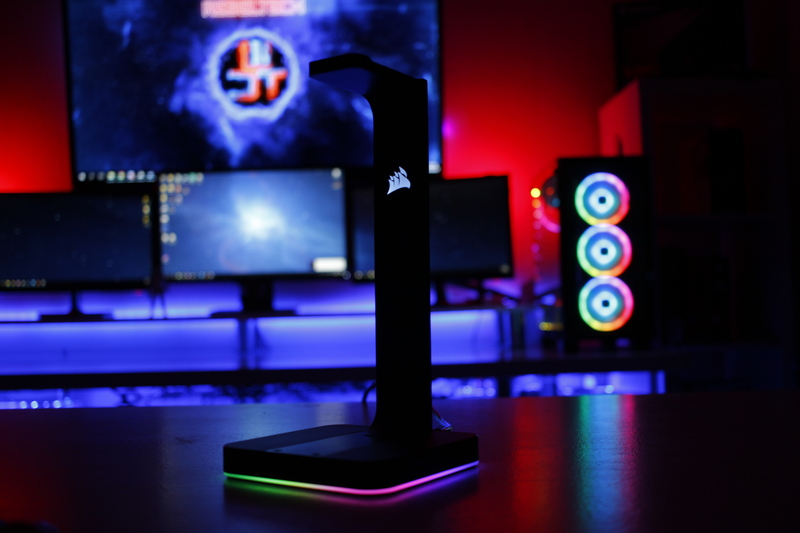 Yes, RGB headphone stand. Right there is when I knew I had to get the ST100 for my setup. But at the cost of R1’000 on Rebeltech here in South Africa or $60 on Amazon, it moved down a bit in my To-Buy-List. But in the end I did buy it, but the question now is, is it actually worth the price? Are there some other features that might make it more worth buying or do you just pay for the RGB? Well taking a look at the design of ST100, you get a clean black design with that vertical arm that you can rest your headset on. As for the base of the stand, it is quite heavy to prevent the stand from falling over too easily if it gets a few bumps. 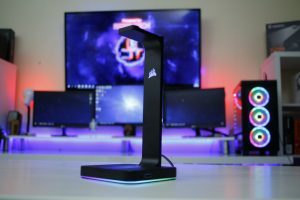 The vertical arm, it is very sturdy and won’t flex no matter what headset you hang on it. For the RGB lighting, you get a strip all around the side of the bass and then also the Corsair logo on the headphone arm. The lighting does deliver a smooth transition between LEDs with no soft areas to ruin the seamless glow. It is not extremely bright, that is probably to not distract you, but I would have liked it to be a bit brighter and have the option to turn it down if I so chose. Now as for those other features this is where they come in. On top of the base you get a single USB 3.1 port. That will most likely be used for something like your wireless headsets dongle or maybe even something like a USB wifi adaptor. 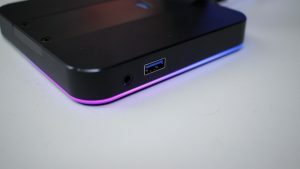 As for the second USB 3.1 port that one is on the right side of the base next to the 3.5mm combo jack that you can connect your stereo headset too. Along with that, the ST100 is able to turn your stereo headsets audio into a virtual 7.1 surround sound, so that’s pretty cool. Now just a quick look underneath the ST100 you get a large rubber grip that helps the stand not slide around too easily on your desk. As for the RGB, the ST100 works with COrsair CUE software that allows you to choose between 8 different effects, each with their own set of secondary commands, like speed, direction, and color. Also because the ST100 uses the CUE software, you are able to sync the lighting from all your corsair peripherals together to get an awesome lighting show. But along with the lighting you are also able to adjust the mic volume of the connected headset, turn on the virtual 7.1 surround sound for gaming which does work quite well. And then also you can choose from some premade EQ presets or make your own to get a perfect balance.